This is one of three consultancy / professional Net Lawman terms and conditions documents which could be used either as website T&C or as a hand out to a client. Not suitable as a negotiated document (for which, see below). All three are for a business model where a professional service uses a website to promote the business. sell your expert and professional service or advice against pre-payment through the website or setting up a subscription. sell some special “pre-pack” of your range of services, as a management consultant might sell a particular specialism, or an architect might sell packs of drawings for self-builders. bring in a prospective client so that you can give him a price for the work he wants, then pay in advance through your website. An example might be a children’s tutor where the website is primarily a medium for information and advance payment. sell a service supported by a product or device. This is a little more complicated because either you license your product or you sell it. Services only, nothing requiring a formal licence. That is at T&C consultancy: professional or trade service; payment options; B2B and B2C. Services, where your expertise depends on heavy use of your intellectual property which will be licensed to your client as part of your deal T&C consultancy: professional or expert service; licenced product. Services, supported by the sale of some physical product, even a dvd or hard copy materials. That is this agreement. You provide a subscription based specialist advisory service where you sell a stream of some renewable part. You are a specialist consultant whose advice depends on the purchase and installation by your client of some widget you sell to them. You provide an athletics training service. Your advice depends on some sort of sophisticated timing or measurement equipment which you sell to your clients. 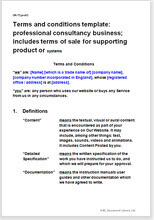 This is a website terms and conditions document for an expert or professional service bought via the Internet but provided personally, probably face to face. Although a website T&C document, it is also suitable, with easy edits, for presenting to a client as “your terms”, without reference to the Internet. It covers (optional) provisions for a close working relationship. It is not for an impersonal, automated service provision. Contains strong provision for confidentiality and protection of your intellectual property - we assume you may use texts or software of great value. If your business model requires that you negotiate the terms of your retainer with each client, then sign the document, you will need a contract document consultancy agreement from our set at Consultancy agreements. You may not need a website T&C document if you do not make any contract via your website. If you trade via the Internet and this document does not fit, have another look at: Web site terms and conditions: service providers. Over 1,400 words of helpful drafting notes.